We are excited to be continuing our monthly workshop series on July 18, 2017 at The Mill in Wilmington, Delaware. 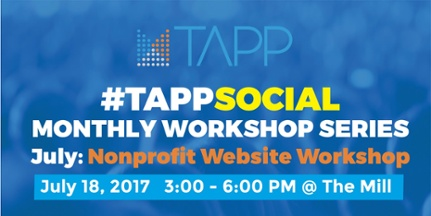 At this workshop, you will hear from leaders in the Digital Marketing and Technology Space who will cover trends and best practices to ensure your organization's website is reaching it's full potential and working as part of a highly-fueled fundraising and awareness generating machine! There is still time to RSVP Here and join us for an engaging afternoon of websites and networking!